Years ago I spied a 10 foot tall gray frog with crossed legs reading a book in Columbus MS with beautiful purple wisteria flowing above its head. I have told numerous people about this wondrous frog. Ten years later, I returned to Columbus on a mission to find the frog. After giving a presentation/reading of my book to a lovely book club at the local library, I asked the members about the notorious frog. Everyone knew the frog to which I referred and directed me to it. I found the frog sitting leisurely on a bench with two friends for the holidays. He had on a hat and I noticed that his legs were spread, he was green, and that he was not 10 feet tall. Oh, I was still mesmerized by him because I love frogs and I love reading, and of course there is no other place I would rather be than in a garden. But I had to wonder about myself. Was I one of those people that told tall tales like the fish that got away which gets bigger each time the story is told? Or am I a romanti-sizer and things that I love grow each time that I talk about them. I met my husband on a rainy New Years Eve. His teeth sparkled in the light of the overhead lamp as he bent to hit the cue ball with his personalized cue stick as he flashed me that million dollar smile. I noticed one dimple in his left cheek that signaled safety while at the same moment I noticed the five stitches above his right eye that signaled bad boy. He later introduced himself with a velvety baritone that resonated into the depth of my soul. I melted into the caramel swirls of brown with flashes of gold that shown in his eyes. Is this romanti-sizing? I will always remember the Columbus frog as a 10 foot tall masterpiece and I will always remember my husband as irresistible. 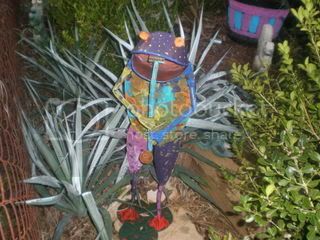 The temp when I found my legendary frog was 80 degrees and the next morning we had a hard frost, 28 degrees and I took my yard frog. Now that is a froggy jump in temp. You need to have that frog in your garden, kind of a sneaky looking guy though, with that hat down over his eyes, along with the great frog from your daughter. 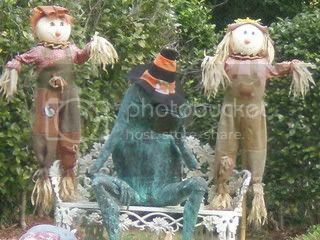 My wife is also a frog lover, and we have a collection of frog statuary that is greatly varied, and spread out all over the place. There is a local artist that does very good watercolors, and frogs are one of her favorites. We have 5 or 6 of them hanging in our home, on the "swamp"wall. The frogs from the kitchen got together for a meeting, and posed for pictures. The reading frog is great for sure but the first frog is a great character also. Can you pass on the praise to your daughter D2D? Something didn't work, my picture isn't there sorry. D2D you have quite a talented daughter. I love your frogs. Thanks on the comments on my daughters frog. I try to get my girls interested in flowers with little success. The middle child is horrified of bugs. My baby saves me from worms and snails. She enjoys my flowers the most. Hope to have more pictures soon of something interesting in the garden or nature.